Our friendly and active Society has around 300 members. If you're an interested beginner, a seasoned gardening veteran, or just like gardening, you will be very welcome and we'd love to hear from you. The villages of Dogmersfield, Winchfield and Crookham Village are located in Hampshire and we welcome new members from all surrounding areas. The society meets regularly at the WI hut in Crookham Village for our series of winter talks and other events such as the AGM. 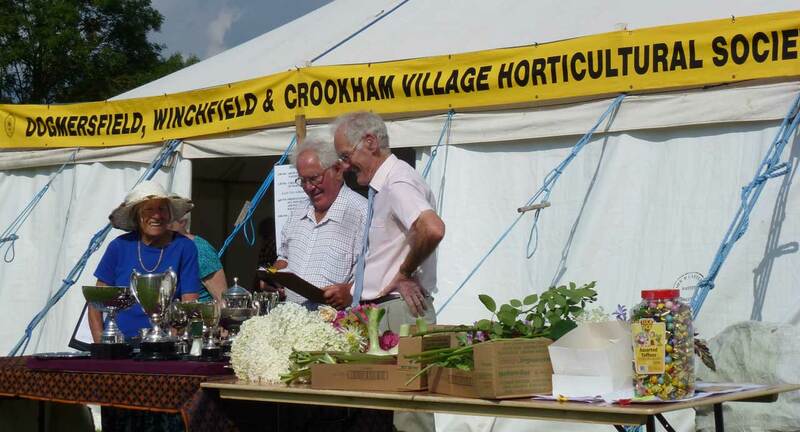 Our annual Flower Show & Fête is held in the delightful setting of Pilcot Farm, Dogmersfield. Our Show Schedule includes an entry form for the Show Classes. A copy of the Schedule can be obtained by contacting one of our committee members. If you think you would like to try your hand at any of the Show Classes, please have a look at the Show Rules (link to ‘Show Rules’ page). We currently issue two newsletters a year to members (see Newsletter page). You can find out more about the benefits of joining the Society on the ‘Join the Society’ page.